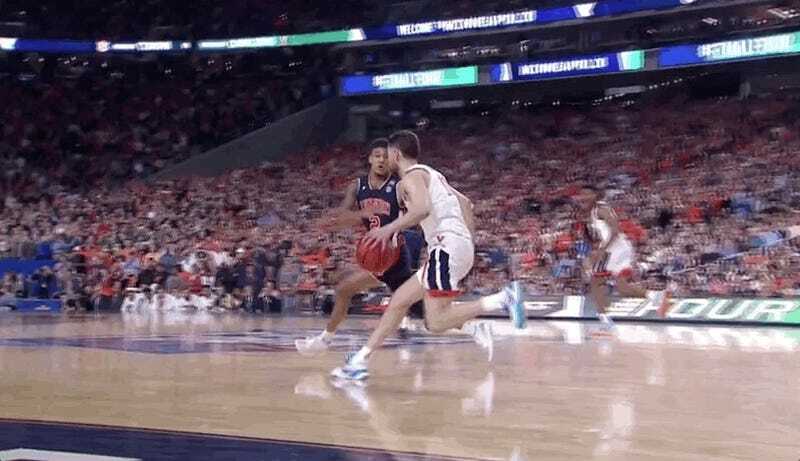 The officials at last night’s Auburn-Virginia Final Four game missed a pretty big call and caused a controversial ending to a game that deserved a lot better, as college refs are wont to do. With less than a second remaining, Auburn’s Samir Doughty committed a worst-case-scenario error and fouled Kyle Guy, one of the best free throw shooters in the country, on his likely game-winning three-point attempt. It was a call that surprised many given the old belief that officials need to “swallow their whistles” in the final moments of the game so that the players can be the ones to decide it at the expense of some extra physicality. Guy would go on to hit all three of his free throws to give his team the 63-62 win and a trip to the final. But, despite the cries of many, it was the correct call to make. No, the real controversy wasn’t discovered until shortly after the game ended. 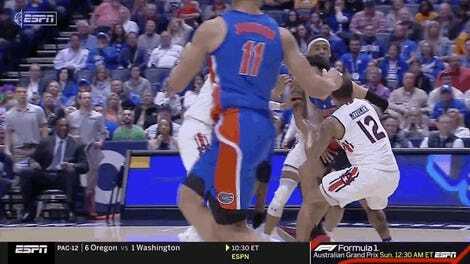 Upon second review of the play right before Virginia’s inbounds, it appeared that Virginia’s Ty Jerome had lost the handle of the ball off his own leg, recovered it and then continued to dribble as if nothing happened. That typically gets called as a double-dribble, but the officials didn’t do anything about it. In fact, not even the players or coaches that had some of the best views of the game didn’t appear to know it happened. Take the interview between CBS’ Tracy Wolfson and Guy, for example. Wolfson asked Guy about the “controversial call” at the end, but that was in reference to the shot and he only mentioned Jerome’s trust in him when talking about the inbounds pass. Even on the Tigers’ side, the only controversy they noticed was on the shooting foul itself. Only Bruce Pearl really touched on the double-dribble and that’s because Wolfson brought it up to him right after the game—who, like the rest of us, likely had the benefit of the slow-motion replay making rounds after the game. As for how it got missed, CBS’s Gene Steratore offered up the idea that the ball bounced in an “unusual” way that doesn’t normally happen when it bounces off of the back of somebody’s leg. It’s a plausible theory, but it doesn’t excuse missing a call when you’re right next to the action as an official who was deemed qualified enough to be in the Final Four. Double-dribbles aren’t supposed to be subject to debate; that’s “supposed” to be left for things like reach-ins and shooting fouls. Still, the idea that an atypical bounce tricked an official into allowing a player to set up a game-winning shot for his team—or the resulting correctly called foul in this case—is about as March-y as you can get with an ending (for better or worse).